Act spontaneously without overstepping your conscious boundaries. Your actions will disrupt, yet bring about a new awakening. The more you enjoy your work – the greater are your successes. If you fear your emotions, repress your thoughts, distrust your imagination or block and judge your aggressive urges as “bad” – you create “unnatural guilt” which requires punishment and leaves you feeling powerless. It is your “belief” in guilt and the fear of your emotions which is your own denied power. Knowledge of your power comes from the natural expression of your feelings combined with vital, passionate action. “Playfully” release yourself from restrictions – use your imagination creatively to find practical solutions to your problems. The freedom of your imagination is your ultimate power. The way to spirit leads through your desires. Your “sexual” energy is raised to a higher level, freeing you from the limitations of duality – the belief that matter and spirit are two “separate” elements. Releasing your desires without first transforming them can result in obsessions, violence and even destruction of the personality. Only a person who has achieved a deep level of inner peace and understanding can deal safely with these forces. They symbolize the life energy locked up in dark hidden areas of the “self” which can not be entered by ordinary means. We call these illusions the “Devil” because those who are not prepared to receive this energy can manifest monsters, evil or the temptation to indulge in violence as you experience a complete release of unconscious energy. This flood of energy can only come through entering hidden area with all their illusions, horrors and desires. Areas that can easily distract the unprepared from their final goal. Demons exist only for those who believe in their existence and they possess only the power you choose to give them. Master your demons – make them your servant – use the liberated energy they represent, rather than falling prey to it. Be purified of your “ego” desires and fears – you can profoundly grasp only what you love. Love is the vital element of intuitive knowledge. Since you can not “love” evil – choose never to enter its chaotic world or you can easily loose your way. Be an “outside” observer as you begin your journey to overcome the materialistic view of life. Overcome any thoughts of misery or depression, any feelings of being chained, imprisoned or the illusion that there is no other alternative. The feelings that love has turned into a trap and you are a “slave” to your desires. The experience of shame and helplessness as you give in to your desires – which eventually result in the acceptance of a bad situation or viewing unhappy conditions as normal and actually fighting against positive change. A “demon” exists only in the “psychic” or mind of the individual who has manifest it through the cooperation of his “will” and his “imagination”. “Silence” of will and imagination are essential in overcoming the materialistic view of life. Only in silence can you “hear”. The vision of “evil” is one full of disturbance, shouting and confused thoughts – the soul is left in a state of disquiet. The vision of God comes quietly and gently – instantly joy, gladness and courage rise in the soul – all thoughts remain untroubled and fear is replaced by joy and contentment – by courage, strength and calmness of thought. The soul is left in a state of tranquility which expresses the love of God. Good only radiates, as love forms an alliance with spiritual hierarchies. It is your “faith” which promotes healing – not the object you focus on. Clarity of thought and moral attitude are necessary to render a “demon” impotent. You are required to “endure” the course of real testing if you wish to convince the entities of the hierarchies of the left that their accusations are unfounded, for they do not represent evil – they are “critical spirits” whose accusations must be proven to lack foundation. Evolution of consciousness – the higher mental, your mind is given full reign – the cutting edge of your intellect. Your full potential comes into awareness here as you pull out all the stops – temptations to push you forward. The realization that anything is possible if you are careful – the mastery of alchemy (discovery of a universal cure for disease and indefinitely prolong life…the process of transforming something common into something special…an inexplicable or mysterious transmuting – change form, appearance or nature to a higher form – transformation.) You can have anything you wish for – but alone, you rarely have the overview and complexity of insight to know what to wish for correctly. The concept of good & evil, like every other mental concept or word opposites is just that – an abstract concept. There is no absolute good or absolute evil, but rather limits which help us define reality – the middle ground between opposites. God being the extreme end of our concept of “good” and the Devil being the extreme end of our concept of “bad” and what we work with is everything that is in – between and ALL is God. Understanding and integrating the upper and lower self, the inner and outer personality – accepting the “whole” person that you are. How can you channel and structure your energies and desires in creative non-manipulative ways? In the first position: Born with the ability to see through the veil when necessary as the Devil is the death of the duality that began with the Lovers. In this lifetime you are one with the energy which brought man the gift of fire and hence spirit which is the gift of life as we know it now. Your deep innate understanding of metaphysics gives you a dual package of great knowledge attached to great responsibility. In the second position: The extent of your knowledge and experience, the range of your activities has given you an edge in material matters. Few can move as quickly and with such a clear sense of purpose as you. In the third position: Pay attention to the other side. Avoid complacency. Allow yourself to be tempted. 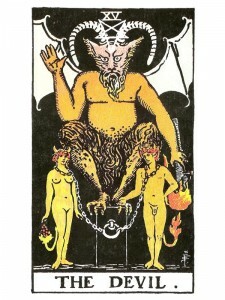 In the fourth position: Here in the position of the birth of duality, The Lovers – is the Devil card indicating the death of duality. Your passion, the basis of your emotional tapes, it nothing less than an intellectual fervor for all things to be united, for the veil to be lifted. This is the heart of a dedicated metaphysician, beating with the same intensity that fired history’s leading philosophical thinkers. This is a love of adventure of the most challenging and daring sort, seeking nothing less than the unknown, the unexperienced. In the fifth position: You are reviewing all the other viewpoints affecting your plans. The mind is open and expansive as it should be. In the sixth position: In the near future your Emotional/Creative Plane is introduced to new worlds and the certain feeling that there is more, much more than you ever imagined. In the seventh position: This in your near future will see you through the most important gate on your path, for it marks the boundary between the inner and outer courtyard. Everything in the inner courtyard is the same as the outer and yet it is different in its degree of intensity as all senses are magnified. This is the hidden validity behind all views that become obvious as the veil is lifted and you are able to focus with the singular visiion of the Third Eye bringing duality to its death. In the eighth position: Perhaps you are experimenting with your liefstyle, even trying things you’ve never liked before. You may be up to your ears in an adventure already, pushing for new sensations, new thrills. In the ninth position: Your heart and the subconscious are disposed to new ideas and challenges. They want a broader range of feelings. In the tenth position: You always knew that there was more to it than this. Right? Well, here comes the proof. You can certainly handle it, but you may want to fasten your seatbelt. Lights! Camera! Action! Thank you Holly, have a blessed day! My god you are WISE. I wish I could intern under you. Such amazing perception on these cards?? We are all on a path that is uniquely our own – we can only help others by providing the example that hopefully they will wish to emulate.